The header describes the video multi-scenarios , scenarios are tree-like structure.. The gain from this idea: it will allow the single video to have different scenarios esp. for educational purposes , also movies can be sold with different prices according to the selected scenarios count..
Also it will change the stories to a new methodology of writing them to cover a lot of different scenarios to simulate the actual people behavior.. 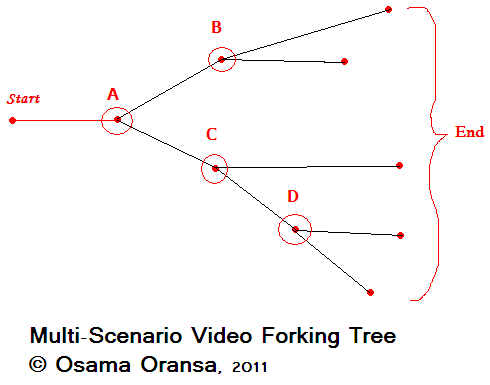 Some movies that fork at certain points according to user selection..scenarios could have different length as well. 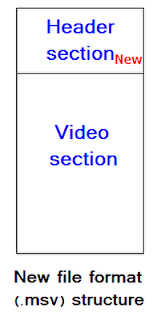 One important feature is the user ability to select all scenarios at start and in that case no scenario forking checks are displayed during playing the video. 2 modes should be supported: multi-videos and single video modes.. 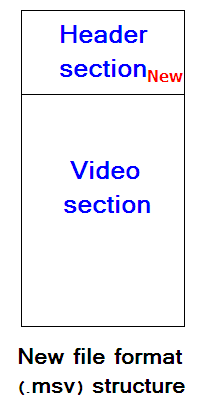 In Mulit-videos each scenario is a separate video but in single video mode the whole video is single video with all scenario embedded inside. The format is not related to the video format, it could be any of the current video formats it is a new way to introduce videos rather then store videos.